At least six people killed in Egypt as violent clashes erupt between Morsi supporters and security forces. At least six people were killed and 190 were wounded on Friday in Egypt as violent clashes erupted between supporters of ousted President Mohammed Morsi and security forces, the Health Ministry said, according to Al Arabiya. 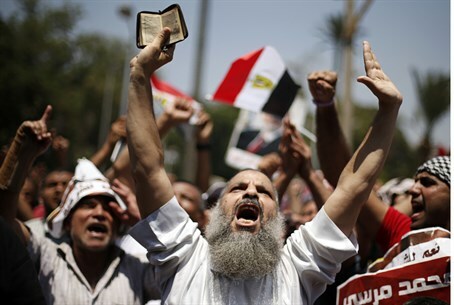 The protests come after a relative lull following the arrests of many Muslim Brotherhood leaders. The Friday rallies were the movement's biggest show of defiance since clashes two weeks ago in which hundreds of protesters were killed. While most protests passed peacefully, Al Jazeera quoted the Health Ministry as having said three people had been killed in fighting between protesters and local residents, including one in Port Said. Morsi's supporters said that another person was also killed in Zagazig in the Sharqiya governorate. One soldier was killed and two others wounded in Port Said after they were attacked by unknown gunmen on Friday night, according to Al Jazeera. The army-backed government has arrested most of the leaders of Morsi's Muslim Brotherhood since he was toppled on July 3, including the movement’s Supreme Guide Mohammed Badie. The arrests have suffocated the protests and all but silenced the movement that ruled Egypt for a year. Just after Friday prayers around 500 protesters set off from central Cairo's Sahib Rumi mosque chanting, "Wake up, don't be afraid, the army must leave! ", "The interior ministry are thugs!" and "Egypt is Islamic, not secular!" By mid-afternoon, thousands were marching in several other Cairo districts and suburbs. The Brotherhood's call for mass protests and sit-ins was seen as a of test how much an ongoing security crackdown has crippled the group. Security forces have accused the Islamist group of using rallies to create chaos. Violence in Egypt peaked on August 14 when police cleared two Brotherhood-led sit-ins in the capital, killing more than 600 people. The move caused days of nationwide violence that has killed more than 1,000 people, most of them Morsi's supporters.